One of the things I love most about meditation is that I get to meditate at home. Things have really changed since I started meditating 17 years ago as it is now more mainstream and there are a growing number of meditation apps that make meditating from home a cinch. I must admit that I didn’t learn to meditate at home. I started out by joining an eight week introduction to meditation course that helped ease me into the habit of meditating. If I was learning to meditate now, I would most likely start out with one of the many apps that are available, or join one of the many free meditation challenges that are offered online. 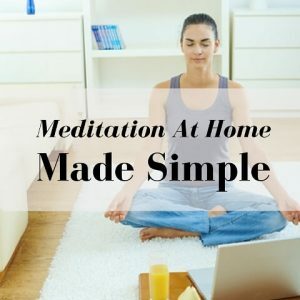 But in case you are not sure if meditation is right for you, and you want to know what you can do to do meditate in the convenience of your home, here’s some simple tips to consider. Decide on what type of meditation you want to start with – There’s plenty of meditation techniques and audio’s to choose from but my recommendation would be to start with mindfulness meditation. This can also be accessed using free trials such as Meditation Dojo. Make sure you are comfortable – Meditation can be done while standing, sitting, moving, or even lying down. Finding somewhere quiet where you’re less likely to be disturbed is a good place to start, then choose what type of meditation you are most drawn to. Most people start with sitting meditation but that’s up to you. Choose a time of day that works for you and stick to it – Meditation works best when you stick to a routine. I like to meditate for 20 minutes every morning as it helps me to start the day with a clear, calm mind. Start with anything from 5 minutes of meditation and work your way up to 20 minutes over time. Have fun with your meditations – Don’t take your meditation time too seriously as it’s not meant to be approached that way. When you approach meditation with an attitude of curiosity and adventure, then you keep it light and fun. Meditation is after all the art of doing nothing with joy. Try not to have any expectations – Let go of the need for your meditations to look or feel a particular way. When you have an expectation of what ‘should’ happen, then you are setting yourself up for failure. Instead, have an attitude on non-judgment towards them and give yourself at least 30 days of constant meditation before you make up your mind about it. Meditation is the most amazing tool at our disposal to enjoy a better quality of life. I’m so glad I got started when I did because meditation is now a lifelong habit for me and the on-going benefits that come from it are never-ending. The secret to long-term success in meditation is to find a meditation technique that resonates with you. You’ll know when that happens because it’ll make meditating easy and fun for you. If you’re even thinking about trying meditation then I urge you to just do it and see how it goes for you over the next 30 days.